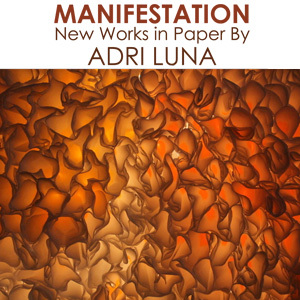 Arts Visalia is proud to present, Manifestaion: New Works in Paper by Adri Luna. The works in this exhibition are a brand new series of paper sculptures and large scale installations, building upon other recent shows the artist has had produced. Having originally studied printmaking and painting, Luna has more recently focused on works on paper, from small, delicate paper sculptures to twenty-five foot installations of filling galleries. Visitors to the exhibition will have the opportunity to experience both, as the artist will create a new and unique series of works specially for this show. Born and raised in Visalia, Adri Luna is a College of the Sequoias alumnus, later studying at the Kansas City Art Institute, from which she received a Bachelor of Fine Arts. Since graduation, she has established herself as an emerging artist on the Midwest art scene and remains active in the very exciting Kansas City art community. More information about the artist and her work can be found at her website, www.adriluna.com. Manifestation: New Works in Paper by Adri Luna will be on display at Arts Visalia from November 6 through November 27 with an opening reception on the evening of Friday, November 6th from 6:00 to 8:00 pm. Admission is free and open to the public. Arts Visalia is located in downtown Visalia, California at 214 East Oak Avenue. For more information, call (559) 739-0905.